The Gleason U-Reel provides ultimate flexibility... larger diameter and/or wider spools, single or dual spring motors, chain drive where needed. In addition, the modular U-Reel design allows us to provide a custom reel for your application at the cost of an off-the-shelf unit. 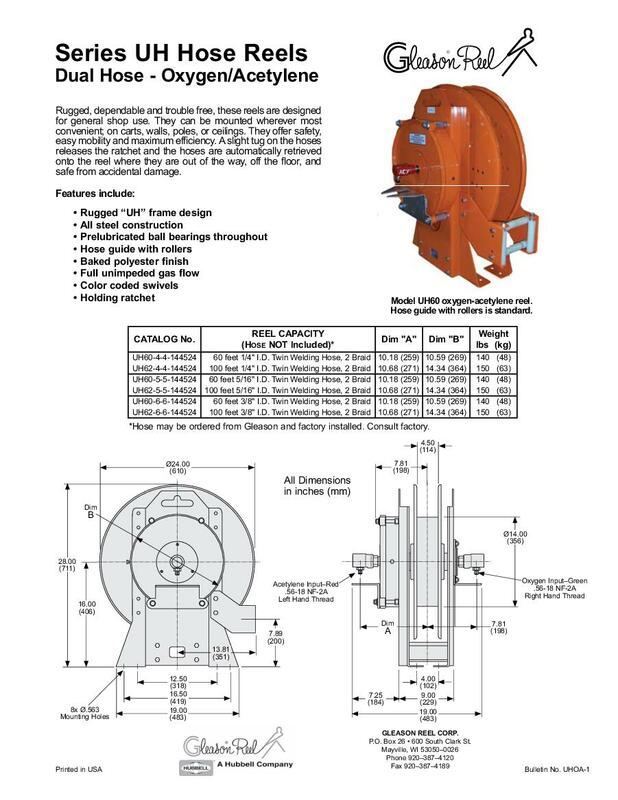 Sizing tables in this catalog enable you to choose your reel from a selection of commonly used sizes. Or, send us your requirements and let the sophisticated Gleason computerized program determine the spool size, spring configuration and drive that will give you the most rugged, smoothest operating and longest lasting reel money can buy. The rugged U-Reel, featuring a heavy frame with spool supported on dual over-sized bearings, can easily handle air, water or hydraulic hoses up to 1.5" I.D. U-Reel is rated at 300 psi per standard hose and hose fittings but high pressure applications to 10,000 p.s.i. are possible with proper hardware. Options include an adjustable roller hose guide, spool lock, ratchet lock, 340o pivot base, dual hose and stainless steel fluid path.